Ok, milestones on raodmap looks cool, but the graphics could be improved (and without spelling errors ) Do you have graphic source files to share? @ideaupdater Can you tell what is this one key bounty system on step 8? It's a good improvement to the sentences, especially the engine search function addition part you have made. However there is still a small spelling error on the 1st step part. Airdrop is spelt incorrectly, might need fixing before the text is added. 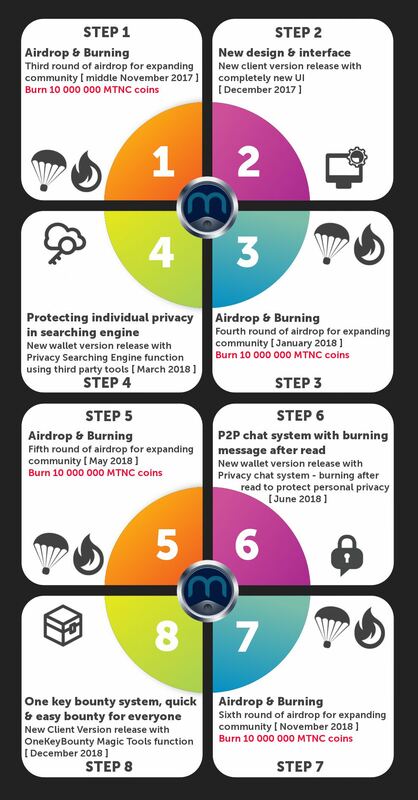 next week will be the third round airdrop ,after that we will burn 10,000,000 mtnc . i think next version client will be released ahead of schedule. wow. great.lots of airdrops mentioned in the new roadmap. How about signature campaign? thank you. raodmap ? What is this? You have spelling errors too. nice , i should change some incorrect grammar and repeat the typesetting again. Onekey bounty function is inspired by DOGE, sharing and giving is the cornerstone of crypto-currency world ,but such culture （sharing and giving） does not begin to take shape not because we are lack of spirit and character ，but because there's too many operating procedures dampened our enthusiasm. onekey bounty design for that purpose ，MTNC will not only protect the privacy but also wanna be a super DOGE with bounty culture. anywhere in your pc ,what ever you are reading the news ,watching the video , chatting with others , sharing your idea , reply the email ,Preparing your work report ...... if you find everything you think should bounty or give a tipping , With just a single click on your mouse , bounty send to them right now, easy and quick( no need to open wallet ,type the address ,numbers and message then send then comfirm ...)， Just one action . how about signature bounties? Thanks, dev. Didn't know about that feature in DOGE. Sounds really great, cool that you will implement it! BTW on roadmap there are 4 coin burnings, plus 1 we had, so the plan is to destroy total of 50 000 000 MTNCs? The new style of the roadmap and the new video looks great. Any news about new exchanges? Great! Please pin the new roadmap in the main thread of the announcement. yes ,we will burn 50,000,000 MTNC even more i think . Will we have signature campaign, dev? Thank you. This version of roadmap is simply amazing. Easy and simple and minimize. The spelling and grammar have been corrected is a good news. wow this is interesting. May i know how long is the roi for this percentage? 1 months? 2 moths? 1 years? cant wait for the roadmap to come and to decide whether or not to get a masternode for myself and hopefully by that time everything still going the positive way. It's the top ROI masternode coin right now if im not mistaken pretty impressive. New MTNC booting interface ! Wow this looks very cool. really sorry , forgive my pool english.im confused why im not learn english carefully before.